People in Dhaka and around have a good reason to be pleased with the announcement that the Singaporean band, Draconis Infernum will hit the stage of Banish the Posers Fest this September. We are talking here about straight black metal and hellish energy, powerful riffs and great melody, basically something that takes you into a dark world which is fascinating and it’s uncanny for the human mind to part with this dimness. We got in contact with their skilled guitar player, Xepher and fortunately, he answered some question of us. 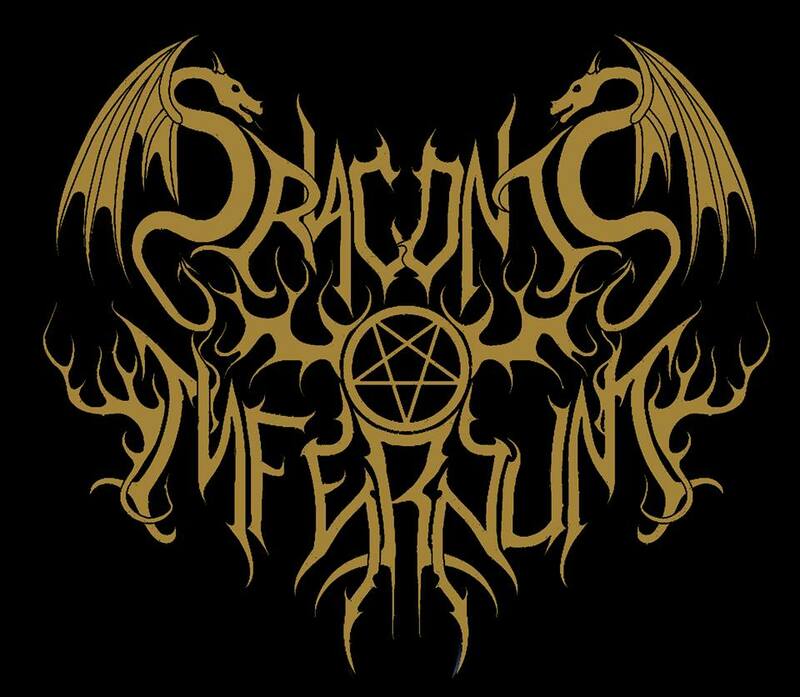 Here we present you a very interesting vision with relation to black metal, borders and tendencies and other facts about Draconis Infernum, their music and their newest release. First of all, infernal hails to you and welcome to Venustas Diabolicus realm. What is the deal now with this Asiatic monster, Draconis Infernum? Any plans for the future regarding the band? Xepher: Infernal hails! Thanks for your time. At this point, all I can say is, we are working on our 10 year anniversary compilation release. Tell me please about writing and recording „The Sacrilegious Eradication”. How can you describe the general vibe that surrounded the creation of this album? Xepher: We commenced writing the new songs and rehearsing it a few months after the release of our second album and was relatively a breeze. The production of this album took longer than expected, partially because we don’t like to rush ourselves into it and take our time, but it mainly got delayed with the release of this one for more than a year. No thanks to the problems we were facing with the original sound engineer whom we previously worked with, whom suddenly had no more time for us due to some personal problems of his, which lead us to move on to another sound engineer whom we also weren’t quite satisfied with, and finally resulted in us once again taking our songs to another studio for mixing and mastering. In total, we moved studios 3 times in the course of the production of the album, which was absolutely ridiculous and something we have never done before. Nevertheless, nothing can stop us from unleashing this album! And there you have it, the infernal carnage that is “The Sacrilegious Eradication”, which is our best material to date. How went your last tour in Germany concerning crowds, conditions and your personal experience? Would you like to return there in the future? Xepher: It was excellent and we were well received. We will return for sure in just a matter of time. This was our second time there and as before, it was an inspiring and great experience to be there meeting old friends, making new ones, watching other bands play and exploring uncovered territory. Who is your favorite guitar player? And besides other musicians, where does your inspiration come from? Xepher: The riff master, Tony Iommi… My inspiration comes from listening and watching other bands play live, going through everyday life and of course, proving all the naysayers of the band wrong. I saw some footage from a show you had in Vietnam, last year. Most of the stories I heard about this place could not be linked to the metal music. So, would you like to tell us about this gig in Hanoi? How does it feel to play metal there? Xepher: I personally felt it was a very exotic place to have a metal gig and also at the same time, very inspiring since it’s a new scene unlike everywhere else where the scene has either been over developed or just dysfunctional. 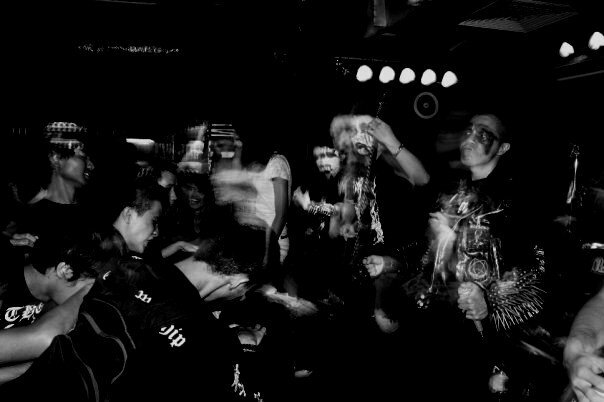 At that point when we were there for the gig, it was a new beginning for them and also to add, that it was a night of history, as it was the first ever Black Metal show to be held in Vietnam and we could not be more honored to be part of it with an attendance surprisingly of about 200 plus people, which was pretty amazing. I have almost zero knowledge about the metal scene in Vietnam. What can you tell us about it? 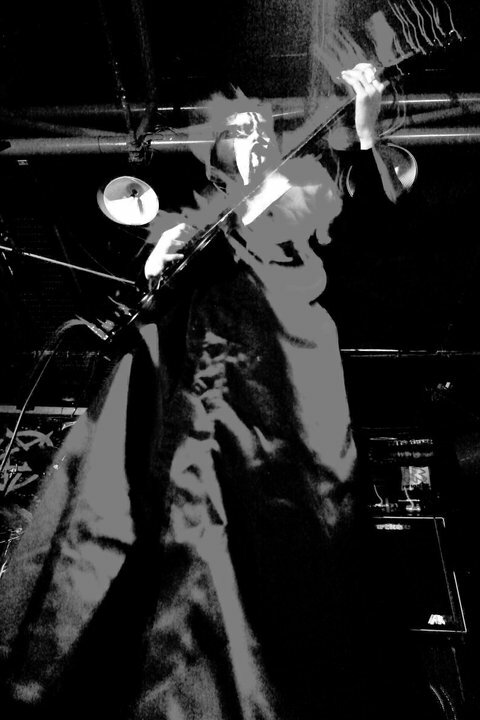 Xepher: I don’t know much about it, I only know of Vietnamese Black Metal bands like Vothana and Sword of Darkness. In terms of Black Metal bands, there is not much of a scene and is pretty obscure. 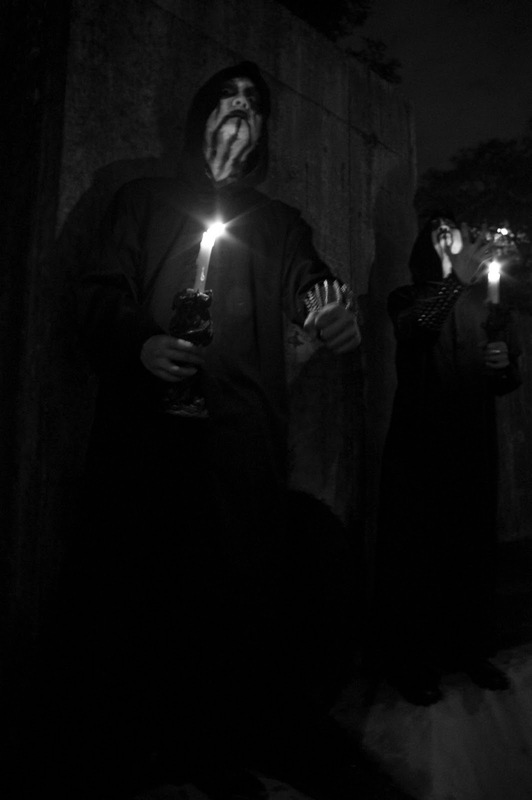 It also seems like the people there are more into the European style of Black Metal rather than the bestial South American kind of Black Metal. Metalheads there are very similar to the Japanese – soft spoken and polite but total demons in the pit. Now, we go to your home country, because metal has a bit more credit there. Black metal and death metal are the most emphasized metal genres in the entire Southern and Southeastern Asia. For sure, this has to do with some kind of socio-cultural issues that developed in these areas. What issues can you identify for these musical tendencies when it comes to Singapore? Xepher: I would like to think that it is the physical conditioning of the landscape and weather. Look across the globe and see where harsher Death Metal and Black Metal come from and you will see a pattern. You will find that all the hot countries sound very raspy and hot, as compared to bands from colder countries. The Socio-cultural aspect only matters at the degree of extremity. Countries with mellower cultural background will be more into the more melodic style. Look at the kind of bands popular in Japan, and then look at the kind of bands that are popular in Sri Lanka. That already says a lot. Then take it back to the classic Big Three of Germany and compare it to the sound of the American Big Four. Then take a look at where they are more famous in, before coming to the lyrics (for example, when they talk about “death”, how do these bands differ in the way they see “death”?). 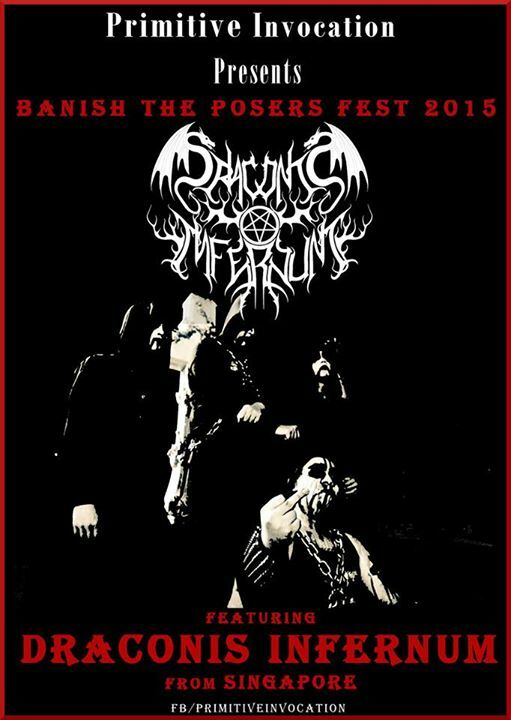 Recently, Draconis Infernum was confirmed for Banish the Posers Fest in Dhaka, this September. What do you know about this event? If tomorrow you will play there, let’s say, how would you describe your mood? Xepher: We do know of this event that is relatively new and has had bands like Manzer on the past line-ups. It does not matter where and when the shows are, we look forward to it and giving it our all. When did you meet Hans Fyrste of Svarttjern for the first time? What made you work together for the Urgehal cover? Xepher: We met Hans Fyrste in Germany on our first trip along with the guys from Urgehal at the festival we played in 2009. The guys from Urgehal dedicated “Mirror Satan”, a song off their set to us, in which we were very honored and remembered till this day. When Trondr passed away in 2012, I decided to return the favor and do a tribute to him by doing the Urgehal cover with Hans Fyrste on vocals as we have always talked about collaborating on a song and so this was how it came about. Do you believe in specific formulas of creating something? Xepher: It depends. If you’re talking about song writing, I have a collection of riffs that I will string together when the time is right. That’s usually how the song writing process comes along. How does black metal vary from region to region in your view? Xepher: The same points mentioned before in the previous question could be illustrated best with Black Metal. Just listen to the bands and then look at their origin. You will see this very clearly like where are most of the DSBM bands from as an example, and then look at the more Bestial War Metal style and where are these bands from mostly. This is also where it gets interesting, because even in the specific cases of “bands sounding like they’re not from there”, you still see traces that differentiate them. Take bands like Teitanblood and Demonomancy and compare them to Blasphemy and Archgoat and Black Witchery. Then you listen to Draconis Infernum, listen to Marduk, Urgehal, Thunderbolt, Infernal War and you will soon see that apart from the speed and bpm we play in, and the certain influences, ambience and atmosphere, you take these out of the equation and what are you left with? Nothing in common! That is the real beauty, as well as the true essence that is Black Metal – Diversity through Individuality and Separatism displayed at its most primal instinct. What is the story of Draconis Infernum? How did it all start in terms of reason? Xepher: Primal Instinct… For everything else you just have to read our biography. A while ago, I read an interview featuring you and your mate, Niloc, which was published three years ago, in some website. You were asked about some advices that you can give to guitar players and your answer was: „stare at the sun.” What was there in your words? Was it sarcasm, a personal belief or do you simply think that sun gazing is helpful for musicians because of its effect on the human mind? Xepher: I’ll leave that to you to interpret. What is the role of evil forces today? What do they mean for you? Xepher: It is the bringer of balance to keep things in check. Not forget that it was light in the first place that created a shadow. If one day you reach the outer space, moving on a fresh and clean planet that is untouched by corrupted religious concepts, would you miss the blasphemous themes of this black metal world? Xepher: You are what your past made you to be. We do not need to miss it, it will always be in us. Black Metal will still stand even then, even if it exists just as a reminder of what the world once used to be like. History needs to be taught to the next generation if you want to maintain the purity of that dogma-free world. I think we are good for now. Thank you for your time and in the end, if there is something that you want to say to people who love or hate your stuff, here is plenty of space to do it and you choose the direction. Xepher: Thanks for your time! We look forward to seeing you guys in September. In the meantime, do check out our latest album ‘The Sacrilegious Eradication’ released through Ketzer Records.